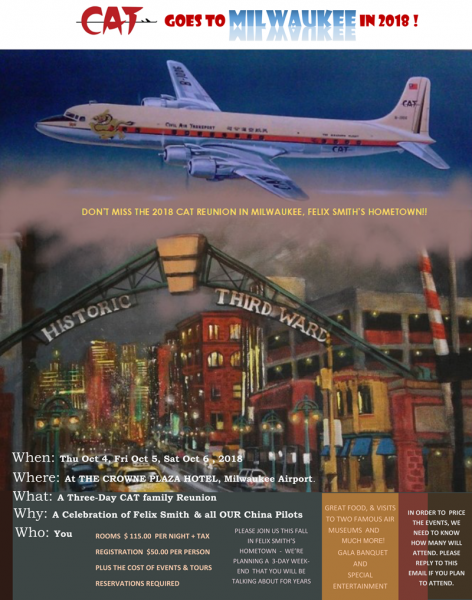 The 2019 CAT Reunion will be in Washington DC, joining the Air America Reunion! Registration information and full agenda will be available on the AAM Website, and in an upcoming CAT eNewsletter. Full details about the reunion will also be included in our next Bulletin. Meanwhile, please make your hotel and travel reservations! Room Rate is $119.00, which includes 10% off on Potomac Restaurant Breakfast (Buffet Only). This special room rate is good through April 29 at 5:00 pm EST. Reservations can be canceled the day prior to arrival by 4:00 pm Eastern Standard Time. It will be a great reunion – the first with Cynthia as our President! What a wonderful opportunity for us to visit General Chennault and Anna’s graves and pay our respects. If you have any questions or need assistance, please contact Lloyd Coleman at [email protected] or 562-706-7186. CAT Reunion 2018 was held in celebration of our Chairman Felix Smith’s long (100 years) and remarkable life. The reunion took place in his hometown of Milwaukee, Wisconsin from October 4 to 7. A reunion report will be available in the next issue of our Bulletin. Logged in members can view our most recent CAT BULLETINS. The reunion was held in Minneapolis, MN from May 31 to June 4, 2017. The Air America Association put together a fun-filled reunion, which included special events with the Hmong community in Minneapolis. Members can see photos from this reunion and many others in our CAT GALLERIES. Please log in to view them. If you have any difficulties, feel free to contact Carol at [email protected]. Our Dallas/Richardson reunion was a cozy and intimate affair. Although small in attendance numbers it sure was made up for with warmth and a terrific sense of family. Personally, I truly had a wonderful time. I would like to thank Lloyd Coleman, Pat Schier, Mary Shaver and Jo and Weldon Cabaniss for doing such an extraordinary job and making the reunion a success. Of course, we could not have done it without Carol Burridge, Toby Canlas, Auntie Naila (Lampard) and others pitching in and making the event so inviting. On Friday night we had our traditional Chinese dinner at The Royal China Restaurant. We now have proof why it has been selected by Dallas area residents as their favorite restaurant. The Taiwanese owner, George Kao, his family and staff went out of their way to make us feel welcomed. Their extraordinary food kept us well fed and delighted and I can say without a doubt that we had one of the tastiest Chinese dinners I can remember. The surprise of the evening was the attendance of Colin Lampard and his wife, Carol, and we celebrated the occasions of his birthday and recent retirement. On Saturday morning we held our annual CAT Association Business Meeting where your EMC officers were re-elected. The only regret is that due to health issues we begrudgingly accepted Pat (Shaver) Schier’s resignation as Reunion Chairperson. We will miss Pat’s tireless efforts and can never thank her properly for the memories she has afforded us all. Although Pat’s departure is sad for us, we know that the reunion leadership will be in good hands with Lloyd Coleman, and that Pat will be there to straighten us out should we wander off the right path. Thank you, Pat! retirement from UTD. Although the CAT Air America (AAM) archives will be left in very capable hands, we will miss Paul at The McDermott Library and the History of Aviation Council meetings. That night, the Hospitality Suite took on an intimate club feel with all of us engaged in conversation while continuing to view more nostalgic CAT videos. It was truly a great night catching up with family and friends. We toasted a few libations to friends in attendance and to those we lost along the way. The highlight of the night came with karaoke lounge singing led by Toby Canlas and Lloyd Coleman, with many others jumping in from time to time. Now THAT was entertainment! The spirit of CAT was alive and well. Thank you to all who contributed and attended to make the reunion a success. 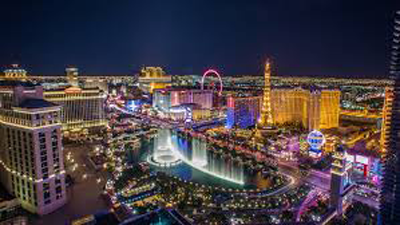 Harrah’s Resort in Las Vegas was fabulous! Members can see photos from the reunion in our CAT GALLERIES and in the December 2015 Bulletin on our CAT BULLETINS page. Please log in to view them. If you have any difficulties, contact Carol at [email protected]. A great tradition has been established. The CAT / Air America Reunion in Dallas was a huge success! The reunion was held in Arlington (Dallas), Texas from May 28 ~ June 1, 2014. At the Wednesday AAM Board annual meeting, our Air America brethren welcomed us with open arms. Felix headed the CAT representation with style and grace. We had a great exchange of ideas and laid the roadmap for future cooperation. I want to thank Mike Kandt and the rest of the Air America Association Board for their continued support. Thursday’s activities included a trip to the University of Texas at Dallas (UTD) archives and a dinner at the Frontiers of Flight Museum at Dallas Love Field. The museum and UTD put together a fantastic exhibit of CAT and AAM artifacts, articles and photos on our history and activities. I still get goosebumps every time I see Bob Buol’s POW flag. The McDermott Library History of Aviation Council and their wives were our special guests for the evening. Our Friday night CAT-sponsored Chinese dinner was a sell-out. We were honored to have Jim Glerum and his wife Diane as our special guests. The food was outstanding and the beer and wine flowed nicely. So much so, that we had to make a few runs to the grocery store around the block for replenishment. (Earthquake McGoon must have been smiling!) Cynthia Chennault honored us with a riveting talk on The General and on his admiration and loyalty towards his men and staff. The AVG Flying Tigers can-do spirit was highlighted as a clear legacy for the CAT and Air America community. To many, this was the first time a link between all of us became apparent. The evening was topped off with a fun and lively AAM auction of CAT, AAM and “Christians In Action” memorabilia. On Saturday morning we attended the AAM general meeting and held our annual CAT Association business meeting. Both meetings were well attended. Saturday’s banquet hosted by AAM was the pinnacle of the combined reunion. Between the bar, the dinner and the music, a good time was had by all. William “Jake” Wehrell of AAM gave a stunning rendition of “A Toast to the Flag” by John Jay Daly. The Marine Honor Guard members were invited to join in the dinner and festivities. Country Western dance lessons and general foolery completed the evening. It was truly stimulating to see a great interaction between both CAT and AAM members of all ages and backgrounds. Many thanks to Pat Schier and Kathy Bruner who worked so hard to make it the success that it was! We all enjoyed our time together at the Town and Country Resort in beautiful, sunny San Diego! Many thanks to Lloyd Coleman and Pat Shaver Schier for their tireless work orchestrating yet another memorable get together. This reunion demonstrated in so many ways that we are not just an organization, we are a family. CAT Reunion 2012 in San Francisco was a huge success! THANK YOU to everyone who worked so hard on this year’s reunion . . . and many thanks as well to our distinguished guests and all of you who made the trip out to San Francisco to join the celebration! A report and photographs were published in the Bulletin. The backdrop for our banquet was the Civil Air Transport (CAT) Exhibit a the SFO Museum, on view through April, 2013 – Curator John Hill and his staff mounted a wonderfully crafted exhibit paying tribute to the unique history of CAT through photographs, documents and a wide variety of items and memorabilia on loan from CAT Members and the University of Texas at Dallas. A fascinating exhibit in a stunning venue. During the banquet evening, we were all moved by the debut of Monte and Klaire Markham‘s poignant film “Faces & Voices of CAT”, which captured the heart and soul of General Chennault and the brave men and women he led. This was a short film made especially for this event, and it has given us renewed inspiration to continue our fundraising efforts to allow Monte and Klaire to complete a full-featured documentary film about CAT. “Faces and Voices of CAT” will be mailed to members unable to attend the reunion and take a copy home (one copy per registration). If anyone would like to donate to this important project, please CONTACT US. Even small donations are most welcome, as funding organizations often look at participation as well as the amount raised.